Starbucks Coffee Co. will bring its Mobile Order & Pay to 300 stores in the Toronto area on Oct. 13, the coffee brewing firm announced on Tuesday. An update to the mobile app on iOS will add a new option to the top of the user interface – “Order.” Users can place orders for drink and food and then choose what Starbucks they’ll pick it up from. When they arrive, a barista has the order ready and hands it over. No need to wait in line. It’s the latest effort that Starbucks has made to boost interest in its successful mobile app, which enables both a payments method and a loyalty program. For customers, it’s a convenient way to pay and earn rewards for their repeat business. For Starbucks, it’s a treasure trove of data that tells a story about customer behaviour. According to Starbucks, mobile payments account for 18 per cent of all in-store transactions in its Canadian locations today. More than 1 million Canadians are active My Starbucks Rewards members. Starbucks is rolling its Mobile Order & Pay feature into Canada after just completing the roll-out at its company-owned U.S. stores Sept. 22. While it won’t share specific numbers on the performance of the program there, Mills says that the feature is driving incremental visits and beating internal benchmarks. Behind the scenes, your Starbucks account is charged for your order when you place it from your device. At the location that you’ve selected to pick it up, an Epson printer spits out a sticker with your name and the order items, one at a time. Baristas prepare it and store it on a shelf behind the counter until you come in and ask for it. 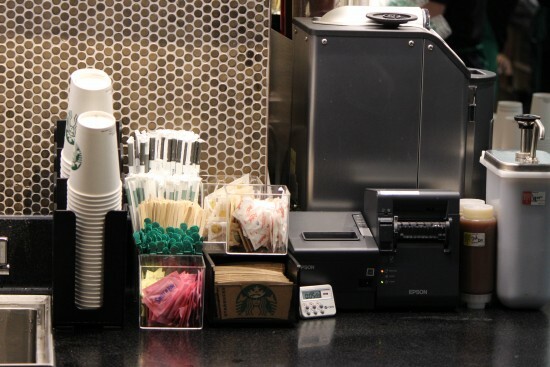 Starbucks locations offering Mobile Order & Pay receive the orders from this Epson printer. Starbucks Mobile Order & Pay will be available in other Canadian cities sometime in 2016, the company says. There are about 1,300 Starbucks locations in Canada at present. Support for the Android app is also in the works.